1980 Graduated from Indian College of Art, Kolkata, India. 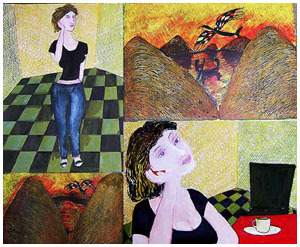 2004 Exhibition of digital paintings at Birla Academy of Arts & Culture, Kolkata. 1989 Exhibition of paintings & drawings at Academy of Fine Arts, Kolkata. 2004 At Lalit Kala Akademi, New Delhi. 2005-1989 Birla Academy of Art & Culture(Annual), Kolkata. 1990 "Calcutta though the eyes of painters" - an exhibition to celebrate "300 Years of Kolkata" at Kolkata & Mumbai. 1989 "Young Faces" an exhibiiton by Birla Academy of Art & Culture, Kolkata. 1988 Innaugaral exhibition of Regional Art Centre of LKA-Bhubaneswar. 1986 National Exhibition of Art at Lalit Kala Akademi (Academy of Fine Arts), Kolkata. 1986 Young Artist's Workshop, Max Mueller Bhawan, Kolkata. 1985-82 Birla Academy of Art & Culture(Annual), Kolkata. 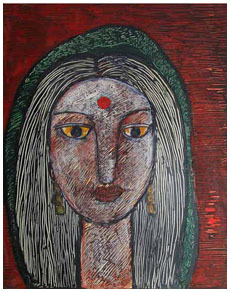 1985 Bharat Bhawan(biennail)-Exhibiton at Roopankar Art Gallery, Bhopal. 1985 National Exhibition of Art at Lalit Kala Akademi (Rabindra Bhavan), New Delhi. 1984 Young Artist's Workshop, Max Mueller Bhawan, Kolkata. 1982 At Academy of Fine Arts, Kolkata. 1982 Shridharani Gallery, New Delhi. 1980 All India Academy of Fine Arts(Mid Summer), Kolkata. 1980,79 All India Academy of Fine Arts(Annual), Kolkata. 1980 At Birla Acadmey of Art and Culture, Kolkata. 1980-2002 Several exhibitions with groups in Kolkata, Delhi & Mumbai. Several private collection in India and abroad.